Date of Original Warrant:1881. Date of present Warrant: January 25,1847. Meets: Third Friday every month. No meeting in May & June, Election: November. Installation: December. Date of Original Warrant:1811. Date of present Warrant: January,1847. Meets: Third Friday every month. No meeting in May & June, Election: November. Installation: December. To know about the origin of the Lodge of Universal Charity one has to go back in time to the year 1784 when the Carnatic war ended with a treaty between the British forces and Tippu Sultan. The British soldiers whose war duties ended with this treaty and who had considerable spare time to socialize turned their attention to promoting Freemasonry which was their favourite peace time activity. Under the leadership of Terence Gahagan, an energetic and active Mason, a Lodge was formed named Carnatic Military Lodge No. II. This Lodge functioned well for several years until 1811 when a split took place and a few of its members decided to quit and form a new Lodge. 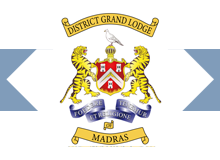 The new Lodge was named The Lodge of Universal Charity and was given the surrendered warrant of another Lodge known as Strength and Beauty VIII Vellore. That Lodge was formed in 1795 but had ceased to function from 1806. Thus was born the Lodge of Universal Charity as a descendant of two lodges. Its first Master was John Burden one of the masons who had broken away from the Carnatic Lodge II and had petitioned for the formation of the new Lodge. The Lodge of Universal Charity thus formed functioned well from 1811 to 1830. But from1831, for a period of about 15 years, the Lodge remained in abeyance owing to paucity of members. Many of the members returned to their native land or had other reasons to become inactive. It is interesting to know that the warrant and furniture of the Lodge which were then in the charge of Andrew Wight, the Master, were preserved carefully by him in the hope of one day being able to revive the Lodge. His hope was fulfilled when on 15th May 1846, that is after a gap of 15 long years, the Lodge was revived and he was re-installed as the Worshipful Master of the Lodge by the then Deputy Provincial Grand Master, Rt. Wor. Bro J.C. Morris. A full account of the revival meeting was published in the “Madras Spectator” dated 21st May 1846. The editor of the paper W.B. Glover was one of the distinguished masons present at the installation ceremony. The Lodge has been functioning continuously since then. It celebrated its centenary in 1946 and its 150th year in 1996. It is now 165 years old, not counting the 20 years before 1830 when also it functioned. Presently the Lodge has a strength of 47 Resident Members, 4 Non-resident Members and 2 Honorary Members. The oldest member is Wor. Bro V.V. Venkatasubramanian aged 95, He has been a member of the lodge for the past 65 years and attends the lodge meetings even now with a lot of enthusiasm. He has had the privilege of participating in the centenary as well as the Sesquicentennial celebrations of the Lodge. We have another member who has completed 50 years in Freemasonry – W.Bro. I. Varkey. There are a few other members who have completed 30 and more years. The Lodge has in its possession a beautiful Punch Bowl which is more than 200 years old. 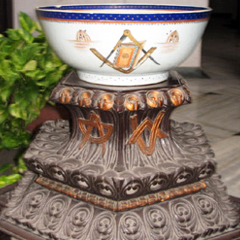 It was received as a gift in 1813 from the Carnatic Lodge No II, the parent Lodge of Lodge of Universal Charity. We display it annually at our installation meetings. 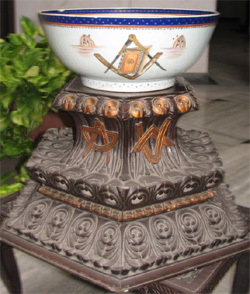 Such display serves to remind the brethren about the antiquity of the Lodge and also makes them feel proud that the Lodge has in its possession an unique piece of antique associated with Masonry. The Permanent Committee of the Lodge of Universal Charity No 273 is pleased to present the Annual Report for the year ended 30th November 2014. The year commenced with the Installation of W Bro Ravi Kesavan, as the W.Master, into the Eastern Chair of this Ancient Lodge. The Lodge is set for a continuous line of aspiring Master Masons into this high office, and it is hoped that, with the assistance and kindly advice of the Past Masters the high standards in administration, ritual working, and well ruling of the Lodge will remain consistent with the traditions set by our illustrious predecessors. The membership of the Lodge commenced with 53 Resident Members, 6 Non-resident Members and 2 Honorary Members. During the year there were 5 Resignations bringing the total membership at the end of the year to 54 (Resident 49 & Non-Resident 5) and 2 Honorary members. The practice of singing the Opening Hymn and Closing Ode is maintained and the National Anthem is rendered at the end of each meeting. The Lodge met 10 times with an average attendance of 26. There were 2 passings and 3 raisings during the year. Portions of ritual working were assigned to junior brethren with Past Masters ably assisting them, thereby maintaining the camaraderie, which is the hall mark of this Lodge. W Bro Sunil Koliyot was appointed as Mentor of the Lodge. The mentoring process was put into active practice as in the previous years, which had benefitted the younger Brethren. Also Initiates and younger brethren were under-the-charge of senior Brethren such as W Bro Sukesh Menon, W.Bro. D.Rajasekaran and W.Bro A.C.Rajasekaran. On 18th August 2014, W.Bro. Sunil Koliyot, Mentor of the Lodge, gave a lecture about the Masonic Regalia and how to recognize the various symbols and emblems, on the various colors of the officers of the lodge and also about various type of badges. True to the name of our Lodge we do charity as much as possible. This year till now Rs.________ have been spent on charity in terms of educational scholarship, medical assistance etc. As always contributions were made to Lodge Ampthill for the Annual & Lodge Quilon for the half yearly and Investiture meeting of DGL. Wor. Br Varkey made an introductory statement particularly for the benefit of new Brethren about the background and incorporation of the Trust and placed on record the monumental work done by the promoters of the Trust – Late Wor. Bro. W.T.Sri Hari Rao and Late Wor. Br. V.V.Venkatsubramanium in donating the piece of land in Uthandi to the Trust for the purpose of Lodge Universal Charity. This was followed by a detailed account of various activities and the present financial position of the Trust by the Treasurer Wor. Br. D. Rajasekaran. The meeting proceeded with the Progress of the Project and Wor. Br. Rajasekaran explained the various options available for raising funds etc. Wor. Br. Sunil Koliyot explained the progress made in fencing the Property and requested that he needs further funds to erect a main gate and other subsidiary works. After discussions it was decided to authorize the Treasurer to release the necessary funds to complete the work. The meeting discussed the present situation of the IT appeal which is still pending. Wor Br. Rajasekaran explained in detail regarding the Appeal and he mentioned that hopefully this will be sorted out very soon. Consequent up on the retirement of Wor Br. C Ravindran a vacancy has arisen in the permanent trustees for which no decision has been taken and the matter is pending to be taken up at the next meeting. W.Bro.Sukesh Menon launched the Lodge Website www.lodgeuc273.org on 18th Oct 2013. The web site was created by Bro. Arvind Gopalakrishnan on his own initiative. Over the last twelve months, most brethren have been keeping reasonably good health. There had been no report of any brother having had any serious illness. As usual attendance of our Lodge was one of the highest in both the Annual Investiture Meeting at Coimbatore under the banner of Lodge Ambhill No: 3682 on 8th Feb 2014 and the Half Yearly Meeting at Kollam under the banner of The Lodge Quilon No 5839 on 9th Aug 2014. W.Bro.D.Rajasekaran , President, The District Board of General Purposes. W.Bro. Sukesh Menon, District Grand Director of Ceremonies. W.Bro. Sunil Koliyot, District Grand Superintendent of Works. W.Bro.A.C. Rajasekaran, District Assistant Grand Director of Ceremonies. W.Bro. Muthu Singaram, Past District Grand Standard Bearer. W.Bro. Peter Kurien Manavalan, Past District Grand Standard Bearer. W.Bro. Alan Gordan Bartley, Past District Grand Standard Bearer. W.Bro. Achutkumar Chandubhai Patel completed 50 glorious years in Freemasonry and he was felicitated during the regular meeting held on 23rd April 2014 in the august presence of R W Bro Theophilus Arputharaj Devagnanam, R W the DGM, Deputy and Assistant District Grand Masters and aslo Past District Grand Master besides numerous visiting brethren. A silver salver was presented to him by the members, a 50 years lapel pin, a citation, scroll and another silver salver was presented by the Worshipful Master on behalf of Bro Rajesh Thakkar. This was followed by a banquet attended by our ladies. Perfect harmony and camaraderie prevail in our Lodge. Brethren from City lodges and from various recognized sister constitutions were present at some meetings and were reciprocally visited by our Brethren. To place on record, that the WM W. Bro. Ravi Kesavan be sincerely thanked for his valuable services rendered to the Lodge and in recognition of his services, a Past Master’s jewel be presented to him. To place on record that the Treasurer W. Bro. A.C. Rajasekaran, and the Secretary Bro. Dr. Parthiban Manoharan, be sincerely thanked for their valuable services rendered to the Lodge. To authorize payment of a sum of Rs. 10,000/- to the District Grand Charity Fund Trust.